This post is kind of a guide to my life organization that may be of incidental use to others, so I'm putting it out here as reference. Over the past 3 years I had been evolving workflows and systems that aid my ability to gather sufficient focus for professional work, and also for personal development. The key goal of establishing these workflows had been and still is, to mitigate the effects of depression and feel more comfortable with my technical skillsets and capabilities. As things stand now I think the effort has been reasonably successful - I'm operating at about 50-60% efficiency doing part-time work for MetaCell, and volunteer work with OpenWorm. Mentally I break this down into four key stages: Setting goals, creating actionable tasks, scheduling, and prioritization. I don't always succeed, and indeed a fair number of things are resolved on an adhoc basis. These guidelines are however useful for making the process less stressful, and more enjoyable. Where high level goals are concerned, I tend to make use of MindMeister to brainstorm and organize my thoughts. The basic paid package is pretty useful. For instance for my current goal of setting myself up to be a reasonable full-stack web developer, I had laid out a map of the tools I might need, highlighting what I am comfortable with, and what I do not yet know but would like to. Then I pick out a couple of items to set active goals for - typically a personal project that exercises the skills I'd like to maintain. From those project ideas come a set of actionable tasks that will need to be accomplished. To organize those tasks, I'd use Trello. So far the free services from Trello have been more than adequate for my needs. In Trello, I'd break my lists and cards down into notes, and stages of activity. Within each task I can maintain notes about progress, and also set up todo items that can be checked-off as I make progress. Trello supports deadlines for its cards, but I prefer not to use that. 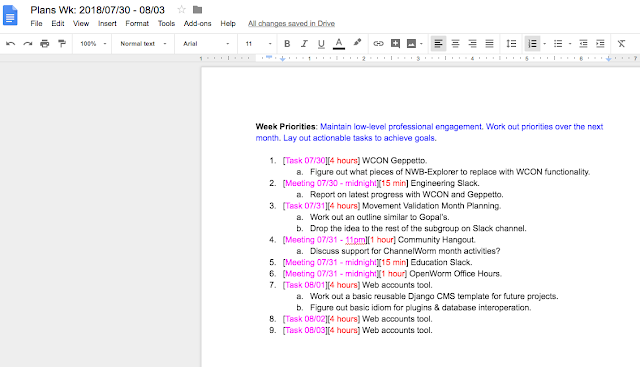 Instead what I do is to make use of Google Drive and documents, to lay out plans and activities for each month, week, and day. I had found it useful in light of my depression symptoms to build a kind of regular time-structure around my life with the understanding that I can sometimes lose focus, and then engineer sufficient wiggling room within that structure to accommodate the loss of focus. Also helpful to me is my organization of activities/tasks around meetings with others in the communities I collaborate under. I found it helpful to make sure that I accomplish (or fail to) tasks pertinent to meetings, so that my presence at that meeting can be meaningful. This stage is a little nebulous and adhoc on my part. Generally it works if I simply allow the pieces to fall into place. However it sometimes helps if I break down sub-tasks to accomplish, and prioritize them before starting work on any given allocated time block. The prioritization is generally set up to help me achieve easier low-hanging fruit first. In my current mental and emotional state, I had noted that I make better progress and achieve greater productivity if I get the sense of satisfaction that all the easier tasks are done, before I get bogged down in the more difficult/troublesome ones. I suffer a lot of angst, stress, and loss of productivity when I feel like I'm bogged down while having other accomplish-able things hovering about at the back of my mind. I recognize I'm not a good multi-tasker, and need to avoid scenarios where I'd feel like I'm juggling stuff over an extended period of time. So there it is - the current state of a professional/personal workflow that is reasonably useful to me. It is not the same as the original version (one that did not take advantage of mind maps, and included daily check-lists to help me deal with memory-related issues then) from three years ago, and continues to evolve. I had intended to document this from a long time ago, but never got around to it until now. I hope this will be helpful to others as well as myself as I continue my journey to rehabilitating myself to a 100% productive professional (and general) life. Wasn't expecting to make another post quite so soon after the last, but I came across this video of some of my heroes talking about scenarios and situations that had afflicted me all my professional life. I cannot help but share this with very few comments - it is highly inspirational for me, and the sense that they are human like myself helps give me hope that some day I can claw my way out of this rut to do something good and useful with my life.